Practitioners and family enterprise clients short circuit all the time in succession planning. That doesn’t mean that the advisor/client relationship breaks down – although sometimes sparks do fly. For present purposes, short circuiting can look and feel like a complete stand still; nothing moves forward. This inertia is frustrating for both sides. Why does this happen and how can we flip the breaker switch to get the process flowing again instead of creating a power blackout? Short Circuit 1: What the bleep is “succession planning” anyway? Practitioners from all backgrounds have a subconscious propensity for using technical jargon and lingo. We do this as a matter of course when conversing with our own kind. However, we have a nasty habit of letting jargon spill over into our conversations with clients and each other on the assumption that we’re all working from the same definition. For instance, one of my pet peeves is the use of the term “succession planning” — one of those terms that gets tossed around like we’re all supposed to know what we are referring to. Some say it refers to management or board succession. Others would say it refers to ownership succession. Some could argue that succession planning is another term for family enterprise continuity planning or estate planning. This example of the lack of clarity in the way we speak with clients is often intimidating for those who may be reluctant to ask what the heck you’re talking about for fear of seeming ignorant. Worse yet, clients often have multiple advisors – each with his/her own spin on the meaning of succession planning. For the insurance advisor, succession planning will undoubtedly involve a life insurance strategy. Bring in a tax lawyer and it will mean doing an estate freeze with family trust ownership as a new shareholder. Enter the governance experts who will focus on management and board succession. Result? The client hears mixed messages, and all the discussions, advice and recommendations become a complex of endlessly tangled wires, punctuated by a switch here and there. The outcomes include confusion, fear of making the wrong decision and, sooner or later, shut-down mode kicks in; the status quo is so much easier to deal with. 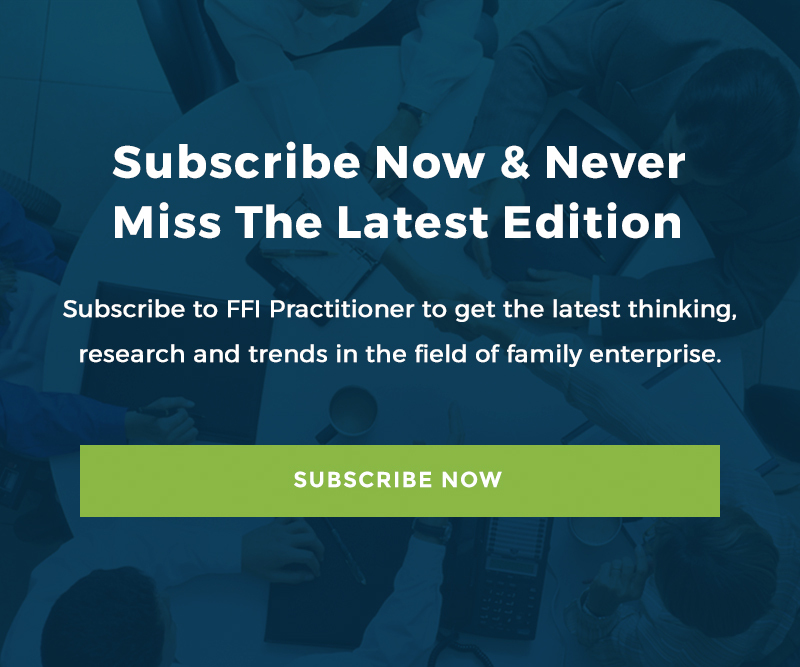 Practitioners “know” what needs to be done to move a family forward in the succession planning process. And frankly most of us “know” what the solution is before our first face-to-face meeting with Client No. 268. We’ve worked with hundreds of families throughout our career and have seen the same issues time and again. So we’re quick to jump to solutions – it’s hard not to because that’s what we are trained to do. It’s what we feel we are expected to do, and this is Client No. 268 after all so surely we know just what to do. The problem is that families want more than the previous client’s solutions. They want their own solutions. Their family isn’t just another switch to be flipped. They want to choose the lighting for their own home and feel certain it is wired and installed safely. They want to understand how this plan will affect them and their family now, when they die and, this is important, for future generations. Is it any wonder that they short circuit, overcome by fear of sparking conflict, going into melt-down at the mere thought of giving up control and shutting down with the uncertainty of how their cash flow needs will be met during retirement when the solution switch is flipped? They are literally left in dark! Then what happens? Meetings get cancelled. Important documents remain unsigned. Or worse, documents are signed but are not understood by the senior generation, let alone the rising generation who, most likely, will bear the brunt of “the plan.” Next step? The sparks fly. There is high potential for misunderstanding, assumptions being made, conflict and all this culminating in the holy grail of litigation. How to put the brakes on? Short Circuit 3: Different advisors / Different current? We’ve all been there – we feel like we’re making good progress, our client is understanding and onboard with the plan we’ve been discussing for months. Enter another advisor – accountant, lawyer, financial planner, insurance broker, business strategist, investment advisor, whomever. We all want to share our knowledge and experience with the client and show that we have important contributions to make. And we probably do. The problem is we come on the scene with our own current – our own expression of the potential difference in charge between the current state and an alternate state in an already highly charged field. In the process we are prone to creating confusion and flipping the client’s breaker switch to off. This approach doesn’t do anyone much good. We don’t need to have all the answers – no one does and no one expects us to. To avoid tripping the circuit breaker, I think we must dial back the electric tension among advisors, rest in the confidence of our own strengths and capabilities, and present a collaborative and united front to our clients. Is it possible to leave the egos out of the room? Can we create a positive energy field that puts the client in a position of power? Only this will create confidence that the team of advisors is on the same wave-length working together and aligned to serve these individuals as a unique family. Over time clients and advisors will gravitate to like-minded advisory teams. Not every team will be the same and not every client wants the same team. Different amperages work well in different homes, but you want the same voltage throughout your home or you need a very good adaptor to make the connection without setting off sparks. Recognition of individual perspectives and a willingness to listen creates opportunity to see not only where you are standing, but also bring conscious witness to other perspectives. For example, a good facilitator can step into an educator role to explain the three-circle model, then help individuals identify where they sit and come to appreciate that with different perspectives come different questions and concerns. Then through facilitation done with objectivity, independence and empathy that advisor can help the collective find and agree on its own solutions. Cindy Radu FCA, LLB, LLM, TEP, ICD.D, FEA, partner BDO Canada LLP, leads the Family Enterprise Continuity practice for Western Canada. She has more than 25 years of legal, fiduciary, trust and governance experience in professional services firms, financial institutions and family offices. She can be reached at [email protected].